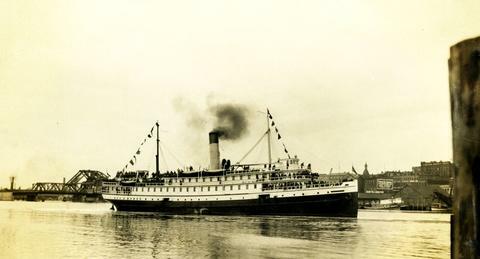 Photograph depicts a steamship in Victoria Harbour with shoreline and buildings in the background. Johnson Street Bridge can be seen behind. Handwritten annotation below the photograph reads, "Princess Royal July 2, 1927 soldiers on Board"